Autoclaves are high risk equipment. The most serious risks come from uncontrolled release of stored energy, which happen when safety critical parts fail. This can cause violent ejection of components/pieces of equipment, the pressuring medium or vessel contents. So, every time an autoclave is to be opened, have you ever asked yourself if zero stored energy can be ensured? You must reduce the risks outlined above by taking appropriate safety measures. What is required depends largely on the size of the autoclave, its operating pressure and the kind of pressurizing medium. 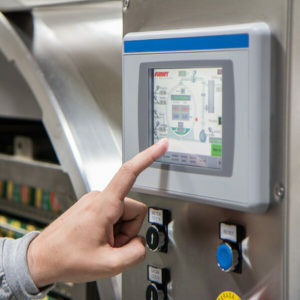 The starting point is to identify the safety critical parts of the autoclave system, including those where a single fault leads to total disengagement or loss of system integrity. – fragile containers, in autoclaves for sterilizing, shattering if exposed to a sudden temperature change. Surdry autoclaves have an intrinsically safe door locking mechanism with electrical switches interlocked with the internal vessel pressure. Then, the autoclave is not capable of being pressurized unless the door is completely closed, the securing mechanism fully engaged and the chamber sealed. When the vessel is pressurized, the Quick Closure system, composed by several ‘teeth’ in the door and vessel flanges, ensures that the door cannot be opened manually using the wheel, due to the internal pressure actin on them. The autoclave should be vented to reduce the internal pressure to atmospheric conditions before the door-securing mechanism can be disengaged. When the internal pressure has been released enough so the door can be slightly opened through the wheel, the special designed-by-Surdry door teeth allow to release residual pressure before the door is completely opened. 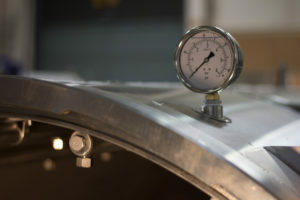 Surdry autoclaves, besides pressure gauges installed in the vessel, have a safety locking system that prevents from opening the door if any residual energy is stored within the vessel. When pulling back the pin to unlatch the door, a valve connected mechanically to such pin is opened. If any water or steam/air under pressure is seen through such valve, you must not turn the wheel. If the flow of water or steam/air is not immediately reduced you must close the safety device and call for maintenance or supervisor attention. Any person entering the chamber must put a lock on the door, remove the key and keep the key with him/her. A tag with his name and signature must be made visible to others to warn them of his presence inside the chamber. Emergency stop devices are used to stop the equipment operation immediately in case of emergency. Learn the positions of all emergency stop devices and how to use them. 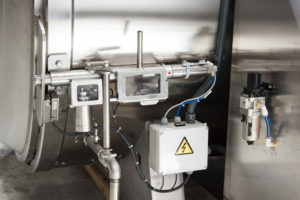 To prevent inadvertent pressurization or scalding at adjacent autoclaves, you must install independent drain and blowdown lines wherever possible. Where this is not possible, there must be additional safety devices to make sure only one autoclave blowdown valve can be in the open position at any one time. Where the exhaust of relevant fluid from one autoclave is reused in another autoclave, it is essential to provide a valve in the transfer line. This must be interlocked with the door-locking mechanism of the autoclave that the relevant fluid is being supplied to. To reduce risks to other people besides the operator further, install the autoclave so its door faces away from main thoroughfares wherever possible. Position controls for the autoclave so they are remote from potential energy release created from failure of the door and from pressure relief, blowdown or drain outlets. Situate the outlets remotely or install additional pipework to the discharge from these devices, to a place where it will not be a hazard. Where trolleys are used to load product into the autoclave, avoid using pedestrian access platforms for this purpose. Provide dedicated trolleys and rails strong enough to support the product’s weight. In all circumstances, do not exceed the maximum load of the trolley, rails and access platforms. The training and instruction given to operators should cover all the procedures and information they need to operate the system safely. It should also cover any special procedures to follow in an emergency. You also need to give existing staff regular refresher training. Surdry provides an exhaustive training at customer’s facilities to ensure the operators can handle the operation proper and safely. Do not allow anyone to enter the confined space of an autoclave, unless you have assessed the risks to health and safety, put a suitable safe system of work in place and provided training in confined space entry for the people involved. Supervisors are crucial in making sure operators follow agreed safe systems of work. They also need to be competent to carry out their duties effectively and may themselves require refresher training, if there are changes to the way you work.